You can describe a communication for distributed arrays in the form of assignment statements by using gmove directive. There are three modes in gmove; “collective mode”, “in mode,” and “out mode.” While collective mode executes two-sided communication among the executing nodes, in/out modes execute one-sided communication among tasks with a task directive. While in mode uses get communication, out mode uses put communication. Copying a part of array a to array b. Array assignment statements in a gmove construct uses triplet. 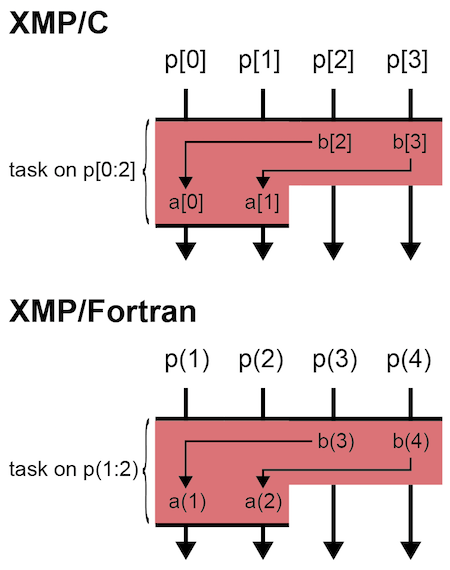 In XMP/C, p sends b - b to p - p, and p sends b to p. Similarly, in XMP/Fortran, p(1) sends b(1) - b(4) to p(3) - p(4), and p(2) sends b(5) to p(4). In this example, it is assignment statements between distributed arrays with the same shape. XMP also supports to assign it with the different shape. While array a is distributed in a cyclic manner, array b is distributed in a block manner. In XMP/C, p sends b and b to p and p. p sends b to p. Each element of p and p will be copied locally. 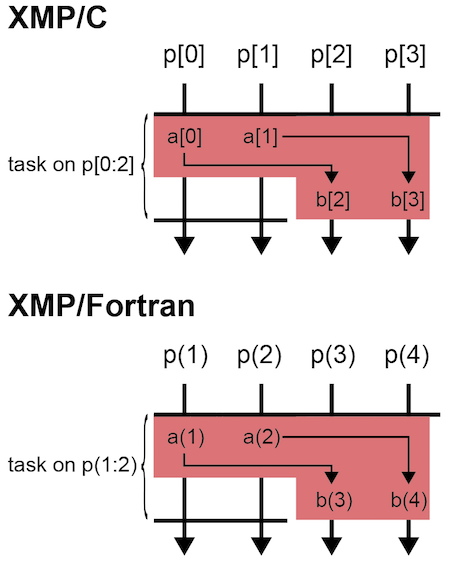 Similarly, in XMP/Fortran, p(1) sends b(1) and b(5) to p(3) and p(4). p(2) sends b(2) to p(3). Each element of p(3) and p(4) will be copied locally. If the number of elements specified on the right-hand side is other than 1, it will not work properly if the number of elements differs between the right-hand side and the left-hand side. By using this method, the shape of a distributed array can be changed during calculation. In this example, copying all elements of array b which is distributed in a block manner to array a which is distributed in a gblock manner. In arrays a and b, communication occurs only for elements whose responsible nodes do not match (the arrow means communication between nodes in figures). In an assignment statement, if one element is specified on the right-hand side and plural elements are specified on the left-hand side, the operation will be broadcast communication. 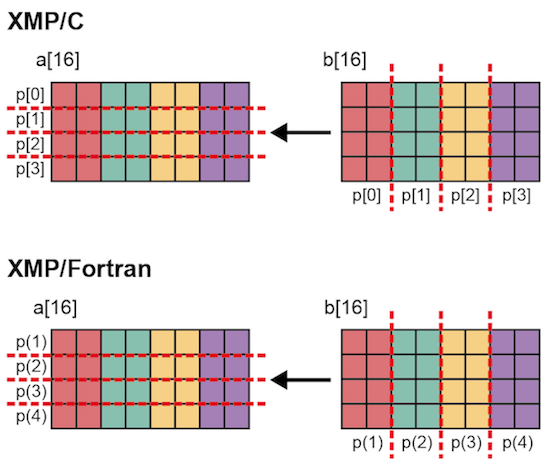 In this example, in XMP/C, an element array b of node p will be broadcasted to the specified index of node p and p. Similarly, in XMP/Fortran, an element array b(1) of node p(1) will be broadcasted to the specified index of node p(3) and p(4). Not only distributed arrays but also duplicated arrays and scalar variables can be described on the right-hand side. In this example, duplicated array and scalar variable are copied to distributed array locally. For this reason, communication does not occur. In this example, in XMP/C, b[0:2] of p, b[2:2] of p, b[4:2] of p and b[6:2] of p are copied to a[:] of p. Similarly, in XMP/Fortran, b(1:2,1) of p(1), b(3:4,1) of p(2), b(5:6,1) of p(3) and b(7:8,1) of p(4) are copied to a(:,1) of p(1). It operates as in mode by setting in clause to gmove directive. In this example, the task directive divides the node set of 4 nodes into two nodes, the first-half and the second-half. In gmove directive which is in mode, it executes get communication from array of second-half node to array of first-half node. In this example, it just reversed the assignment statement of the in mode. In gmove directive which is out mode, it executes put communication from array of first-half node to array of second-half node.